For the millions of people lucky enough to enjoy an extra day off work, it always feels like a blessing. A bank holiday is something to be celebrated, and far too valuable to be squandered. Equally, if a portion of the day is spent sitting in traffic and seemingly going nowhere, the day always feels wasted. We always aim to leave early and return home as late as possible, thereby missing the peaks of daytrippers and bargain-hunters off to the ring-road boot-sales and the reduced racks of out-of-town department stores. In her attempts to talk (with the odd endearing look thrown in), I'm sure the Lady has frequently tried to tell us that she wishes there were far more bank holidays in the year. On these occasions, the collie's ears prick up and rightly sense an adventure beyond a walk round the block or a run in the park. And as it's the August bank holiday, the last of the few before Christmas, we feel obliged to prepare the night before, leave at a respectable hour (just after eight) and start walking approximately an hour later. On the map, Great Plantation lies between Newton Abbot and Bovey Tracey. One end borders the road between the two towns. We turned off the main road at the Drum Bridges roundabout and headed for the sleepy village of Liverton. After a cake from the Post Office to get us in the mood, we entered the plantation from the south. Having only walked through Great Plantation once before on a section of the Templer Way (and losing my bearings in the process) I didn't intend to relive the mistake and checked the map every few paces until I was weary of looking at it. Predictably, I still went wrong (veering left on what I thought was the main path when I should have kept straight on where no definite track appeared to lead.) The result was that we emerged from the wood half a mile or so to the south of our intended exit point. Even with a map, it is often difficult to navigate in plantations, particularly if the map in question is a few years old. When all the trees look identical and quick-growing conifers are felled and replanted in geometrical sections, a map often only partially tallies with what you see around you. I have made this mistake before and I'm sure I'll make it again. One solution is to stay calm and put things in perspective: it's not a wilderness but a few hundred acres - nothing at all to worry about. 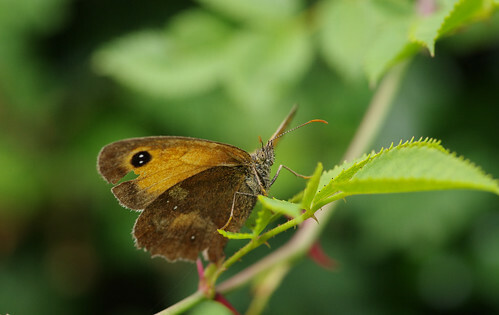 Another is to refocus the eyes like the macro lens on the camera and learn to look closer for signs of difference. Of course, the trees are not all the same on closer inspection. Away from the resinous firs and pines, there is a short row of Guelder Rose and the occasional Wayfaring tree. And on the ground, a lot of the ditches that should hold water have gone bone dry. 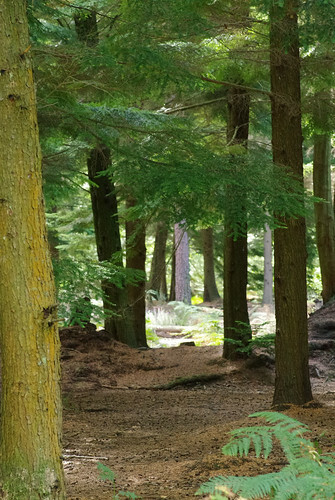 A walk in the woods is always evocative and atmospheric but often difficult to encapsulate on an ordinary day in a photograph, especially when you are missing the mist or the blazing white heat or the cloudy, smoky light rays glancing through gaps in the branches. And so it proves today for Sherry. Things picked up once we left the wood behind. We came to a neglected bridleway off a B-road and must have spent a good half hour wondering how so many flowers and weeds strive to thrive on thin or poor soils. Unfortunately, while we were sheltered in the wood, and felt not one whiff of a breeze, the lane was exposed on the wrong side and the weeds were being blown about all over the place. 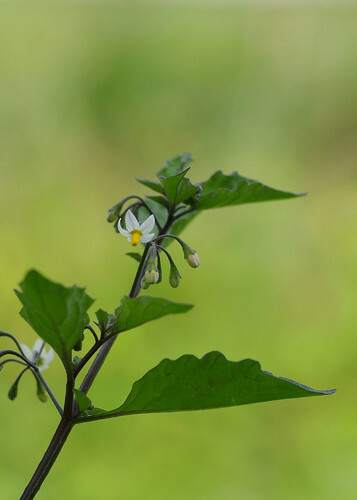 Sherry stubbornly persevered, waiting for a lull, while I wished I had brought The Wild Flower Key along for reference, and made a mental note to come back slightly earlier next year to see everything in its prime; fresh as a daisy and relatively still. The wind showed no sign of abating and eventually we left the lane behind, following a footpath around the outside of the wonderfully named Lookweep Farm to a lane bordered by hedgerows on both sides. I thought this year would be a wonderful year for blackberries but thus far have been rather disappointed. I like my berries on the tart side and recent rainfall has made them too sweet for my tastes. And how come that whenever you take even the smallest nibble it creates an insatiable appetite - making you far hungrier than you were before? We turned away from the verdant country lane and hauled ourselves up a dry, dirty track. I'm glad we kept one eye on the ground. 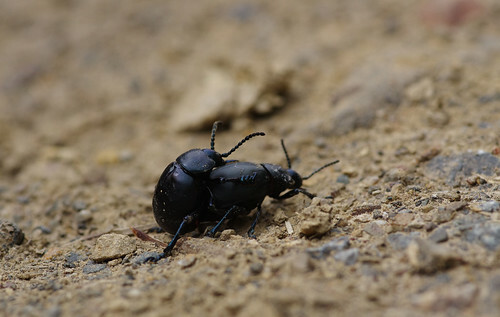 Otherwise, we may have missed these beetles mating and might even have trodden on them. After lunch and a further stop at the Edgemoor Hotel for coffee, we started back on the return leg, taking in the town of Bovey Tracey in order to walk to Little Bradley Ponds. Apart from a couple of fishermen and fish who were hiding out of rods' reach, there was unfortunately little to see. From every aspect the water appeared an univiting shade of brown or green and we interrupted our circuit of the lake to retrace our steps and take another footpath away from it. I'm certainly glad we turned back when we did. 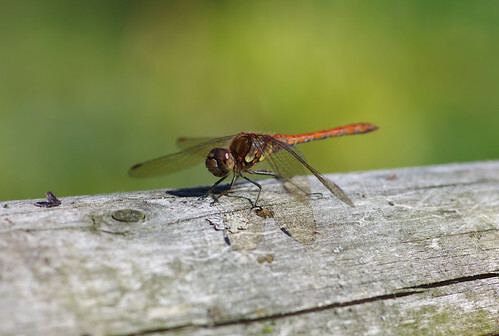 Resting on a wooden fence rail, I spotted a Common Darter dragonfly and Sherry approached cautiously, camera at the ready. The dragonfly stayed relatively still and posed with its wings forward. Look closely enough and you might even detect a shape on the lower face that I took for a smile. From there we continued along a mixture of paths and lanes, through an industrial estate and across the main road before venturing into the main entrance of Great Plantation. We followed a long, straight path (with the odd recourse to the OS map) and took the third turn on the left, heading roughly southward toward where we had entered the wood that morning. By the time we reached the final yards, I swear the trees and bushes were considerably more overgrown than they had been earlier in the day.